Children shouldn’t be expected to know how to start their day off right. They shouldn’t be expected to know how confidence is built, or how momentum and motivation works. But their parents should understand these things. And their parents should help their children understand and live in ways that allow them to be confident and successful. Helping a child develop confidence and momentum daily is not rocket science. In order for a child to receive these things, they need a parent who is present and caring. They need a parent who has put first things first — and already started winning themselves. A parent who has taken care of themselves so they have the wherewithal to be truly mindful of their child’s needs and emotional state. If you help your kids get these four things daily, they will transform. They’ll become healthier, happier, and more confident. They’ll become more successful in all areas of their lives. Because for the past 3.5 years, my wife and I fostered three incredible children who we recently adopted. When we got these kids, they were an absolute wreck! You’d be too if you came from their background. We had to deal with an extreme situation, and necessity is the mother of invention. Our kids are far from perfect. We all have our crazy moments. But they have made amazing progress! And continue to do so daily! When it comes to kids especially, it’s far more powerful to measure the GAINS than the GAPS! Mostly, my incredible wife is the reason for our kid’s success. She’s amazing. She deserves ALL of the credit. Here’s how this “Successful Child Morning Routine” works. And by the way, it can all be accomplished in less than 10 minutes. After a long night’s rest, your body (and your child’s body) is often dehydrated. Hydration first thing in the morning is essential because it increases the production of new muscle and blood cells. Additionally, a hydrated body gets and uses more oxygen, which is needed to be alert and energized. Most people feel groggy the first three to five minutes after waking up. You’ll be stunned by how quickly you become alert and awake if you drink a huge glass of water first thing in the morning. Your body and brain need it. Your children need lots of water first thing in the morning for their developing brains and bodies. A study done by the National Health and Nutrition Examination Survey found that over 50% of children in the United States are dehydrated. This is an easy fix. For adults, it is smart to “super-hydrate” when you first wake-up by drinking over 20 ounces of water. The more the better. While your child is drinking their morning water, it would be incredible if you were giving them a hug or a short back massage. In 2010, researchers at Duke Medical School found that babies with very affectionate and attentive mothers grow up to be happier, more resilient, and less anxious adults. In that study, most of the mothers showed “normal” levels of affection but only 6% shows “high” levels of affection. Numerous studies on the effects of massage show the positive benefits it offers to reduce anxiety in children. A short and loving massage is an incredible way for parents to connect with their children, both physically and emotionally. A study among adults showed that those who received physical affection from their parents as children had less depression and anxiety as adults. Your child needs to feel your love first thing in the morning. Words are extremely powerful. But physical touch is also very important. This doesn’t need to take long. Even 30–60 seconds of loving physical touch counts, like a short massage or a back scratch and some kind words. This will work wonders for your relationship with your child, which is essential for their well-being. It will also work wonders for your child individually in all areas of their life. There’s a growing body of research showing that confidence and positive habits are the product of small daily wins (see BJ Fogg’s research at Stanford for more info). Confidence is fickle. It needs to be re-established daily. Confidence is the byproduct of successful behavior. In the recent hit book, MAKE YOUR BED: Little Things That Can Change Your Life…And Maybe the World, author and famed Navy Seal William McRaven explains how making his bed first thing in the morning changed his life. It got him in the habit of “winning.” It created confidence first thing in the morning, which rippled into other wins throughout the day. Momentum and confidence are highly connected. When you wake up and get a few small wins, your confidence increases. If you wake up and don’t start winning, then confidence drops. When you get even a small win, like making your bed, you feel more confident to keep winning. This leads to momentum. Your children should get a few small and easy wins right after they wake up. This will create new and daily confidence in their lives. Confidence and momentum are that simple, as is motivation. Motivation is the byproduct of positive action. It’s important to note that your confidence as a parent is also based on the fact that you yourself have been winning in the morning before you have interfaced with your child. If you haven’t put first things first, you won’t have as much confidence when you interact with your kids. If you’re not confident yourself, you shouldn’t expect to raise a confident child. You don’t need to do all of these. Even one or two will make a big impact on WHO YOU ARE when you interact with your children first thing in the morning. Your emotional and psychological tone completely influences your children’s. If you’re feeling amazing because you’ve already been winning yourself, then you’ll project that energy onto your children. You’ll love them more. You’ll give them more attention and affection because you’ll have the capacity to do so. They’ll feed off that energy and begin winning themselves. They will be more positive toward others because you’re being more positive and loving toward them. Finally, it’s important that your children are receiving praise and affirmation first thing in the morning, especially in response to the “wins” they are getting. If your child makes their bed and drinks a glass of water first thing in the morning, it is powerful if they are acknowledged for that. Appreciate them for what they’ve done. Affirm their behavior. This will positively condition them to continue doing so. When you express gratitude, you feel more love. Love is a byproduct of positive action. When you express and show love through physical and verbal affection, you’ll feel more love for them. They’ll be more confident and you’ll be more confident as their parent. They’ll be winning because you’ll be winning. I’m stunned how fast the past 3.5 years have gone since we got our kids. When we got our kids, they were 3, 5, and 7. Now they are almost 7, 9, and 11! Don’t waste another day. Your children are worth so much. If you can help your children start winning in the morning, they will get more consistent at winning throughout their life. Of course, perfection should not be the goal. We all have plenty of off days. Parenthood is nuts! Compassion and love are essential for both yourself and your children when things aren’t going as well as they could. Consistency is the goal. Daily progress is the goal. Confidence and momentum are built one day at a time. Every single day. 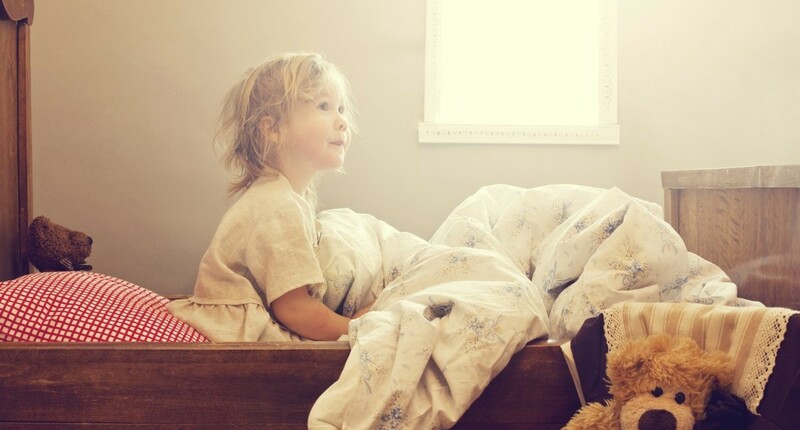 For both your children and you, it all starts with how you wake up in the morning. And then, how you help your kids proactively wake up themselves.